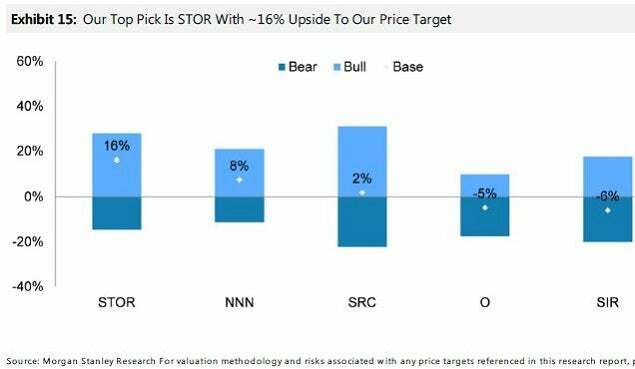 Morgan Stanley analyst Vikram Malhotra on July 23 published a research note, "Picking Triple Nets In A Tough Field" and readjusted ratings and price targets for REITs under coverage. All of the revised target prices are based upon Morgan Stanley's 2016 estimated AFFO per share, and what Malhotra judges to be the most appropriate multiple, given all of the factors considered in his analysis. Malhotra's thesis is that REITs with a high cost of equity and/or leveraged balance sheets will find it tough to compete moving forward in a rising interest rate environment. STORE Capital Corp (NYSE: STOR) $2.65 billion cap, 4.79 percent yield. Upgraded from Equal-Weight to Overweight. Top Pick. Increased PT From $24.50 From $23.00, based on 15.5x 2016E AFFO. National Retail Properties, Inc. (NYSE: NNN) $5 billion cap, 4.67 percent yield. Upgraded from Equal Weight to Overweight; $40.00 PT Unchanged, based on 16.5x 2016E AFFO (vs. 16x five-year average). Spirit Realty Capital, Inc (NYSE: SRC) $4.43 billion cap, 6.78 percent yield. Downgraded To Equal Weight From Overweight. Decreased PT To $10.50 From $13.00, based on 12x 2016E AFFO (in line with current numbers). Select Income REIT (NYSE: SIR) $1.72 billion cap, 10.3 percent yield. Downgraded To Underweight From Equal Weight. Decreased PT to $20.00 from $26.00, based on 8x 2016E AFFO (vs 9.5x three-year average). 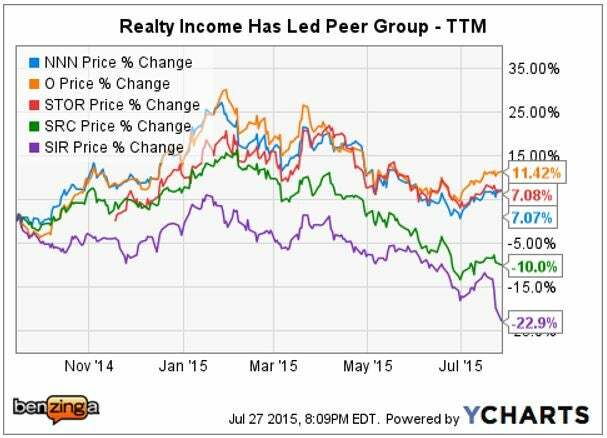 Realty Income Corp (NYSE: O) $11 billion cap, 4.83 percent yield. Maintain at Underweight; $45 PT Unchanged, based on 16x 2016E AFFO (vs 17x five-year average). Notably, shares of Select Income REIT have already plunged after the Morgan Stanley downgrade from $21.27 to $19.43 per share, a loss of 8.6 percent in just three trading days. The single-tenant net-lease model is easy for investors to understand. These REIT landlords enter into long-term leases with credit-worthy tenants, who in addition to monthly rents also pay taxes, insurance and almost all of the maintenance for the property. The lack of maintenance and low capex make these popular properties for many investors to own and competition drives down the initial acquisition cash returns, or cap rates, for desirable assets. A rising interest rate environment puts additional pressure on the spread between a REIT's total cost of capital and the property NOI (net operating income). "In this environment, [Morgan] prefer[s] companies that are best positioned to maintain investment spreads. Low cost of capital, balance sheet flexibility and a targeted investment strategy are key tools," according to Malhotra. The charts below show a notably conservative dividend policy for both NNN and STOR compared with Realty Income, based on AFFO payout percentages. The ability to increase dividend payouts gives REITs another way to positively influence their share prices if they so choose. According to Malhotra's 2016 AFFO estimates, STORE Capital is poised to see the most growth, followed by National Retail. He also feels that Realty Income is currently "overvalued" relative to National Retail, based on overall quality of property locations, as well as National Retail's conservative balance sheet, which it can leverage to grow FFO accretively moving forward. National Retail currently utilizes ~4.3x leverage, vs Realty Income at 5.7x; with STOR at 6.5x, SIR at 6.6x and SRC at just under 7.0x. Morgan Stanley remains bullish on the STORE Capital targeted investment strategy of "buying non-investment grade assets at higher yields," which should help it grow accretively. At the time of this writing, shares of Select Income REIT already slid below Morgan Stanley's revised $20 price target. Select Income is scheduled to report earnings before the market opens on Tuesday, July 28; with a conference call to follow at 10:00 a.m. EDT. Malhotra believes that a dividend yield nearing 10 percent could help to put a floor underneath shares.